Yeah I sat through 4 hours of BS to get the did not install msg. I had problems before i started with the windows updater not being able to download it so I went with the standalone and Failed miserabley. On the good side now that my computer reverted back to original settings it is running better than before I started this whole ordeal imagine that!!! It was actually the standalone 447MB Vista SP1 that failed miserably with the blue screen of death. I may try a couple other machines this weekend, right now I feel it is just not worth the hassle and risk. I will be contacting Acer & Toshiba as to why the update may have failed, though I doubt that will amount to anything. Wow…Microsoft software not working correctly? Who would’ve thunk? 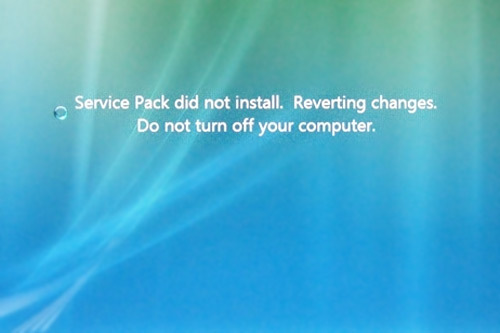 Well, I’ve now tried to install SP1 three times. Twice with Windows Update and once with the stand alone version. The last time was after doing all the things recommended at the Microsoft web page I was directed to after the first failure. Still no luck. I’ve got about 4 hours into this so far. Getting pretty disgusted. I have tried every method to fix this problem 18 strait hours in one sitting and 3 whole days wasted, I uninstalled SP1 and still no fix. So in my case I’m buying a Vista ready Creative PCI SoundCard and will not be installing SP1 untill required if ever. I hope this helps anyone with like problems. GOOD LUCK AND GOD SPEED!!! I think it is truly sad and shameful that Windows Vista SP 1 is not automatically compatible with a) the most common integrated hardware chipsets and drivers on the market for Intel & Realtek and b) major antivirus distributions. I don’t envy Microsoft because there are a ton of variables with of the vast number of machines and softwares out there, as we all know, but you would think that Microsoft could have approached this a little bit by including a pre-installation check and pre-installation notes that amount to something more than making sure you have the AC plugged into your notebook. In all I have been at this for about 24 hours and there don’t seem to be many guaranteed solutions out there. The web is starting to fill up with thousands of people having problems. If I can’t update two A-brand mainstream machines without any add-ons out of three machines I tried it on … I really think SP1 was launched prematurely. I consider it a healthy habit to wait a few days to apply OS X updates, so I will make that a few months to apply Vista updates, and I will not even attempt to install SP1 on critical machines. Ok I woke up monday at around 4:30am feeling sick after a whole weekend messing with my computer, and to my disbelief my comp was in the middle of installing windows service pack without my knowledge but it contiued and installed successfully. Because my onboard card had already failed I did not uninstall it. Later that day my new memory and creative sound card came in. The creative audigy se 7.1 card installed with no problems. since everything is working right and I have been running sp1 I have noticed that less memory is being used at idle and less during application running. also as others have mentioned file moving and copy speeds are also faster. The memory that was ordered was pc3200 while i need pc5300 so it has to be returned. Overall SP1 has now made my Vista work more stable. I hope that the hardware and driver issuses that you are having will be resolved good luck and godspeed!!! Still no word from Acer or Toshiba as to when the drivers might be updated to allow upgrading to Vista SP1.